FILE - An Israeli flag flies near the Golan Heights village of Majdal Shams, Oct. 11, 2018. World leaders are criticizing U.S. President Donald Trump's announcement that the United States will recognize Israeli sovereignty over the Golan Heights. Syria's foreign ministry said Friday Trump's announcement is "irresponsible" and does not change "the fact that the Golan was and will remain Arab and Syrian." A foreign ministry source told Syria's official news agency SANA the announcement "clearly reflects the United States' contempt for international legitimacy and its flagrant violation of U.S. law." 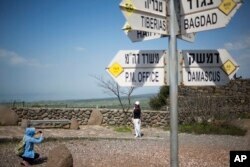 The Golan Heights were captured by Israel in 1967's Six-Day War and have been controlled by Israel since then. Turkish President Recep Tayyip Erdogan said Trump's announcement has brought the region "to the brink of a new crisis and new tensions." Turkish Foreign Minister Mevlut Cavusoglu told members of the Organization of Islamic Cooperation in Istanbul that Israel's "systematic attacks on Al-Aqsa Mosque for years" is proof Israel has no respect for beliefs and holy places or tolerance for living together." Cavusoglu added that "U.S. President Donald Trump's unacceptable comments on the Golan Heights feed this warped mentality." Tourists pose for photograph next to a mock road sign for Damascus, the capital of Syria, and other capitals and cities, in an old outpost in the Golan Heights near the border with Syria, March 22, 2019. Arab League chief Ahmed Aboul Gheit also criticized the announcement, saying, "No country, no matter how important it is, can make such a decision." The Gulf Cooperation Council, a group of six Arab monarchies, said Trump's statement "will not change the reality that ... the Arab Golan Heights is Syrian land occupied by Israel by military force" and undermines "the chances of achieving a just and comprehensive peace." Egypt's foreign ministry denounced Trump's statement, citing U.N. Security Council resolution 497, which rejects Israel's annexation of the territory. The ministry emphasized that global leaders "should respect the resolutions of international legitimacy and the United Nations Charter in respect of the inadmissibility of acquiring land by force." Iranian Foreign Minister Mohammad Javad Zarif predicted, "The personal decisions of Trump ... will lead to crisis in the region." The European Union emphasized it does not recognize Israel's sovereignty over the disputed area. "The position of the EU has not changed," an EU spokeswoman told Reuters. Russia expressed hope that Trump's call for recognition of Israel's sovereignty would not be enacted. "It is just a call for now," said Kremlin spokesman Dmitry Peskov. Trump made the announcement Thursday via Twitter, maintaining the Golan Heights "is of critical strategic and security importance to the State of Israel and Regional Stability!" Trump's statement came while Secretary of State Mike Pompeo was in Jerusalem, the highest-ranking U.S. official ever to visit the contested Western Wall in the holy city of Jerusalem accompanied by an Israeli leader. Israeli Prime Minister Benjamin Netanyahu has accused Iran of attempting to launch attacks on Israel from the Golan Heights, saying, "I think for this reason and many more, it is time that the international community recognizes Israel's stay on the Golan, and the fact that the Golan will always remain part of the State of Israel." Israeli Prime Minister Benjamin Netanyahu, accompanied by U.S. Secretary of State Mike Pompeo, touches the stones of the Western Wall during Pompeo's visit to the site in Jerusalem's Old City, March 21, 2019. Israel formally annexed the territory in 1981. But the international community has not recognized that annexation and considers the Golan Heights to be occupied territory. Amid the regional uproar, Pompeo also met with Lebanon's interior minister on the last leg of a Mideast tour that took him to Israel and Kuwait. The U.S. State Department said the two men "discussed the regional and internal challenges facing Lebanon and how the United States can help support the Interior Ministry's efforts to maintain safety and stability inside Lebanon."